In Michigan, driving, or operating a motor vehicle, under the influence of alcohol (OWI with .08 to .16) or Schedule 1 drugs (cocaine, marijuana, LSD, ecstasy, heroin), (OWPD) is a crime. Upon conviction, the offenses of OWI and OWPD carry the same criminal penalties and licensing sanctions. Operating a vehicle with a blood alcohol content of .17 is known as OWI with High BAC (Super DUI) and is a more serious than the offense of OWI. A person suspected of driving under the influence is required to submit to the chemical test offered by the law enforcement officer. A person that thinks that prosecution for DUI can be avoided by refusing to provide a breath, blood or urine test is sadly mistaken. There are sanctions for refusal pursuant to Michigan's Implied Consent Laws including 1 year license suspension and 6 points. In addition, the police can obtain a search warrant to test the blood of an individual that is suspected to be under the influence of drugs or refuses to comply with testing. The ABDDO LAW DUI defense lawyers have not seen any slow down in the number of arrests in Metro Detroit associated with driving or operating under the influence. In fact, the incidents associated with OWPD (drugs, marijuana) and DUI cases involving prescription drugs are on the rise in every Metro Detroit community. There are three testing methods utilized to test a person's BAC or blood alcohol content: breath, blood and urine. Blood testing is the only direct testing method. Breath and urine testing are indirect methods. However, the most common means of testing for alcohol is by obtaining a breath sample from the individual with an instrument called a BREATHALYZER. The Michigan State Police have chosen to use the DMT DataMaster breath testing equipment. In order for the results from the breathalyzer to be admitted into evidence, the police are required to follow numerous rules and protocol in administering a breath test. Using BAC charts is one way to estimate blood alcohol content. Our DUI defense lawyers frequently refer to BAC charts (like the one below) in our DUI consultations as a comparison with the test results obtained in connection with an OWI or High BAC charge. 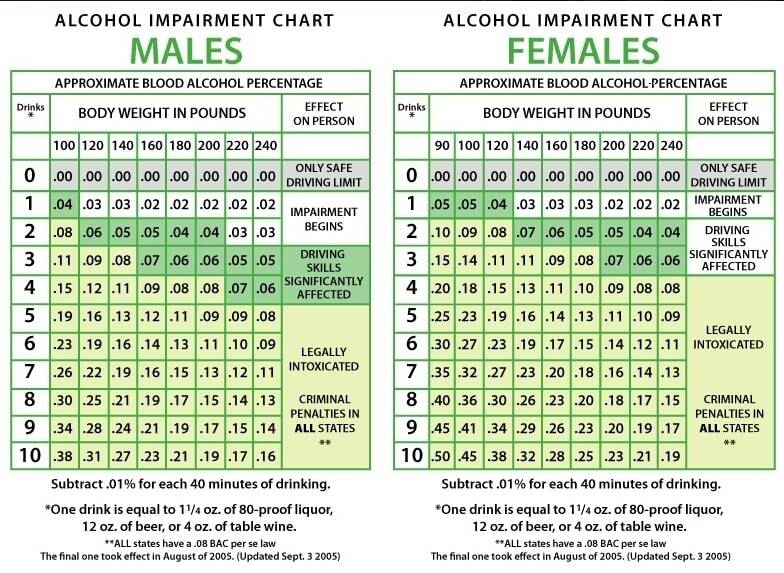 Most BAC charts take 3 variables into consideration: Gender (male or female), Number of Drinks and Body Weight). A fourth variable that is the alcohol elimination rate. The gender variable is important because females statistically absorb more alcohol than males of the same weight and consuming the same number of drinks. According to the 2017 Michigan State Police Drunk Driving Audit, 7,085 individuals submitted to a breath test in the counties of Wayne, Oakland, Macomb and St. Clair. Additionally, there were approximately 3,000 blood tests for alcohol and drugs in these counties. In these counties, 6,717 tested (breath test) scored .08 or more supporting either an OWI or OWI with High BAC. Oakland County administered the most breath tests (2,662) with Troy and Royal Oak reporting some of the highest numbers in the county. Wayne County reported 2,662 breath tests with the City of Westland reporting the highest number in Wayne County. Macomb County reported 1,392 breath tests with high numbers coming out of Shelby Township and Chesterfield Township. St. Clair County reported 298 breath tests and another 110 blood tests (for drugs or alcohol). EMAIL or CALL Abdo Law for a FREE CONSULTATION. Phone messages after business hours are forwarded to our attorneys. We offer same day, evening, weekend appointments and the ability to retain us over the internet. Payment plans and all credit cards accepted. When Can Police Stop a Vehicle?